adventuruss: bake 20: blue cheese biscuits and tomatoes. aka, the dish you make when your gardens raining plump, beautiful tomatoes & you're over caprese salad (wait, did i just admit that out loud?). last weekend i was neck deep in a tomato recipe search. over the last week our garden has exploded and day after day, we're gifted with these unbelievably sweet roma, cherry & heirloom tomatoes. generally i make a killer tomato basil soup, but this year i wanted something different. joy the baker to the rescue! 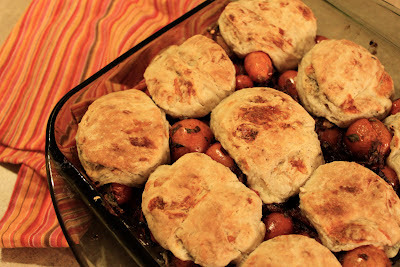 while perusing, i stumbled upon joy's tomato cobbler with blue cheese biscuits recipe. the moment i saw it i knew this was it & went to work. not only did the recipe call for all the tomatoes from our garden, but also incorporated baking. and with the bake 20 challenge in full force it was the perfect opportunity. adjustments: with the exception of omitting the vegetable shortening* from the biscuit recipe and baking nine biscuits atop the tomato mixture, i made no other modifications. review: oh-em-gee. this was fantastic! both myself and a. gobbled it up. as a vegetarian constantly seeking good eats, this dish was so satisfying to both my belly and taste buds. as for a., well, it was "too vegetarian for him" (as in too many vegetables and not enough "substance"). he still enjoyed it, but didn't think it made the best main course. 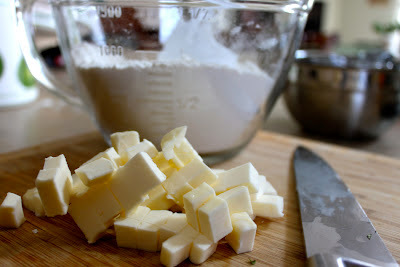 *personally, i'm not a fan of processed shortenings and tend to omit them from all recipes. no plan. just making things that look good and hopefully in the process, finding a new appreciation of baking. feel free to join me in the Bake 20 Challenge.